The Double Vision Bracelet is a chunky but wonderful bracelet to make and wear. It has a great deal of visual interest. Additionally, there are a couple of other variations, Twisted Vision and Single Vision. 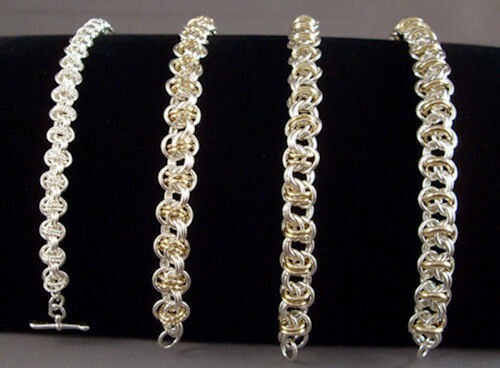 The picture illustrates from left to right: Twisted Vision (small) in sterling silver, Twisted Vision in two tone, Double Vision in two tone and Single Vision in two tone. The kit is for the Double Vision bracelet, but the directions include the ring sizes and information for the other variations. This is an advanced beginner weave. A sterling silver balloon clasp is included in the kit.